In this quick guide, I want to show you exactly how you can set up a wired baby monitor in your child’s nursery so that you aren’t exposing them to any unnecessary EMF radiation. Don’t worry, it’s actually quite a bit easier than you would think! I’ll show you exactly what products you’ll need, and then I’ll walk you through setting it up step by step! Afterward we’ll talk a little bit about why this is so important, and I’ll point you to some valuable resources. Ok, there are a few crucial supplies that we’ll need to make this work. So let’s just take a quick second and talk about what we need, and why it’s the right thing for the job! Pick it up on Amazon. Alright, most importantly, this is the wired baby monitor that we need. One of the interesting things about baby monitors these days is that it is almost impossible to actually find or buy a non-wireless baby monitor. 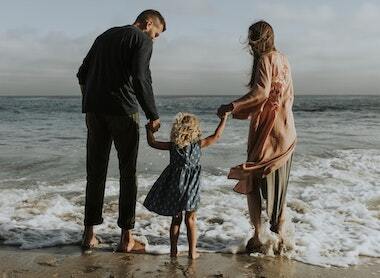 Companies have simply stopped manufacturing them, since most parents were wanting, and using, wireless connectivity for the simplicity of it. However, as more and more people are becoming aware of the dangers of EMF radiation, there is a surge of interest in a wired baby monitor setup. So, we need this D-link baby monitor because it is the best one available that actually has an ethernet port (see the image on the right) so that we can disable the WiFi and hardwire it instead. 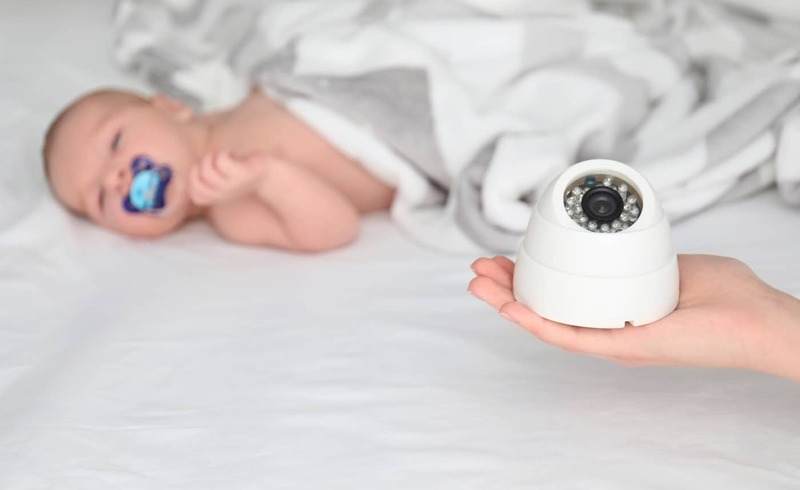 720p HD camera that lets you pan, tilt, and zoom so that you can easily look around the nursery from anywhere. Night vision so that you can easily see the entire room clearly. It’s also not very expensive for what the quality, so, first step is to add this to your cart. Alright, the next thing we need is this amazing ethernet adapter. I can’t tell you how amazing this product is, because it essentially allows us to make wireless technologies wired, and therefore significantly safer. Basically, it is an adapter that you plug into the wall. It uses the existing wiring in your home to transmit data instead of using WiFi. So, in the case of wiring a baby monitor, this allows us to run an ethernet cable from the camera to one of these adapters. The other adapter will have an ethernet cable running to our router or access point. (Don’t worry, I’ll walk you through all of this step by step. This link to Amazon takes you to a kit that will give you a pair of these, which is all we need to make this work. They are extremely simple to use, so don’t worry. As a note, if you’re home already has ethernet wired into the room that your baby sleeps, you probably won’t need this. You can instead just use the existing ethernet wiring. Bottom line, these are absolutely amazing at allowing you to utilize otherwise wireless technologies in a significantly safer way. The next thing we’ll want is a pair of shielded ethernet cables, one for the babies room, and one for the room that we’ll be in. We want shielded cables because it shields against magnetic radiation, while still providing the same speed and data transfer rates. We’ll use one cable to go from our wired baby monitor to our D-link adapter, and the other cable to go from our second D-link adapter to our router. Just measure the distance you’ll need in each room to know how long of a cable to get. You’ll measure from wherever you’re going to place your camera in the babies room, to the nearest electrical outlet. 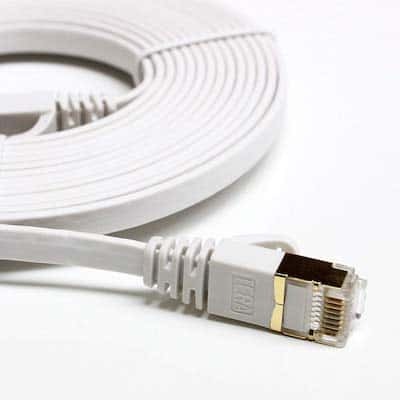 I like this shielded ethernet cable in particular because it’s flat, making it really easy to run along your trim or floor without it being very noticeable. You can easily staple it or tape it to the wall or floor and keep it out of the way. You’ll also be able to run it behind furniture in a seamless way. Alright, now that we have all the tools we need, let’s talk about how to setup our wired baby monitor! Alright, this is fairly simple to setup, the hardest part honestly is connecting the device to the app, but I’ll walk you through that as well. The first thing you’ll want to do when you unbox your D-Link baby monitor, is to plug it directly into your home router. 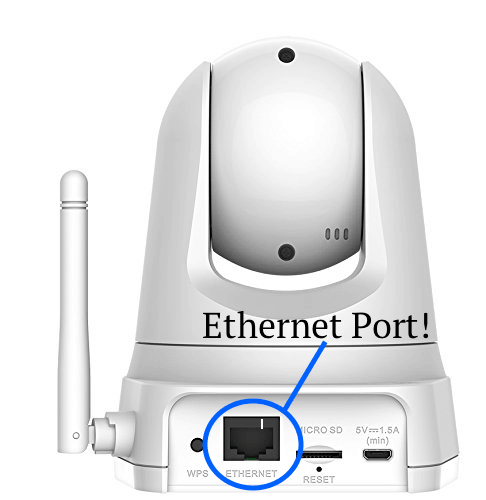 So, use one of the ethernet cables that you picked up, and plug one end into the back of the D-Link camera, and the other end into any open port on your router. This will give internet access to the device which will allow it to gain an IP address, download any needed firmware updates, and connect to the D-Link cloud so that you can stream the video anywhere in the world. The next thing we want to do, is setup our camera in our nursery or babies room. So, choose a good shelf or night stand where you can setup the camera and get a good view of the crib or nursery. Once you’ve chosen a good spot, go ahead and plug one of your shielded ethernet cables into the back of the camera. Find the nearest outlet to the camera, and plug in one of your D-Link adapters. Plug the other end of the ethernet cable into this adapter. 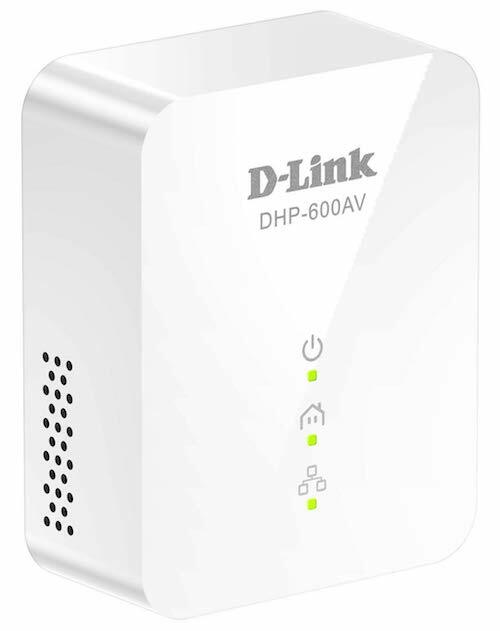 The next thing we need to do, is connect our other D-link powerline adapter to our router. This will allow our baby monitor to connect to the internet, and will allow us to view it on our devices. So, go find where your home router or modem is (you may just have a modem if you only have wired internet in the home). Plug your other D-link adapter into the outlet nearest to your router or modem. Then run an ethernet cable from one of the ports on your router to the adapter. This will give internet access through the wiring in your home, to our baby monitor in the nursery. The way that the D-link camera is designed, is that once it has internet access via ethernet, it should automatically disable the Wireless capabilities. You’ll know if the WiFi is off because the WPS light on the front of the camera should no longer be green. Once your camera is connected to the internet, we can view the camera through just about any device, including a smartphone, laptop, tablet, etc. We do this through the free App from D-Link. The last thing we need to do is setup the Free D-Link app so we can view and control the camera. There should be instructions in the box, and online, but I’ll walk you through the basic steps. If you get stuck, just call the D-Link customer support at 1-877-453-5465, they are actually really helpful. Make sure your phone or tablet is connected to your WiFi network. Scan or manually enter the QR code that is provided. This will connect the camera to the. app. When it asks if you have a “WPS” button, select No. We do this because we don’t want to connect via wireless. Then finish clicking through the steps, and Voila, you should be all connected! Just go back the app and select the “remote” tab at the bottom to view and control the camera. Again, if you get stuck, just call customer support and they’ll help you get through the instructions really easily. Alright, now that we have our wired baby monitor all setup, and baby is safe from RF radiation, it’s time to take a quick look at how we can use our smartphone or tablet without using wireless. I’ll be talking about this more in a later post, but wanted to give you the quick guide. Although I think the D-Link camera above, and the setup I described is your best option for a wired baby monitor, there are a few others that are readily available, so I wanted to give them a shoutout as well. All of these baby monitors have Ethernet connectivity, but you’ll want to read the instructions and check with the manufacturer to learn how to disable the WiFi. Most, like the D-Link above, automatically turn off the WiFi connectivity when an ethernet cable is applied, but not all. Check the current price on Amazon. So, most importantly, the Matop baby monitor does have an ethernet port on the back, which is surprisingly rare. Remote Viewing – So just like the D-link, once you’ve wired up this baby monitor with one of those shielded ethernet cables, you’ll be able to view the camera from just about any device like a smartphone, iPad, Mac, computer, etc. Recording – Does your baby do cute things in the nursery or in the crib? This ethernet baby monitor supports an SD card so that you can actually set it up to record anything and watch it back later. Overall, this is a pretty good baby monitor for the price, and one of the few ethernet babies monitors that you can get on Amazon. So, if you’re not excited about the D-Link camera I recommended then this is a pretty good option. 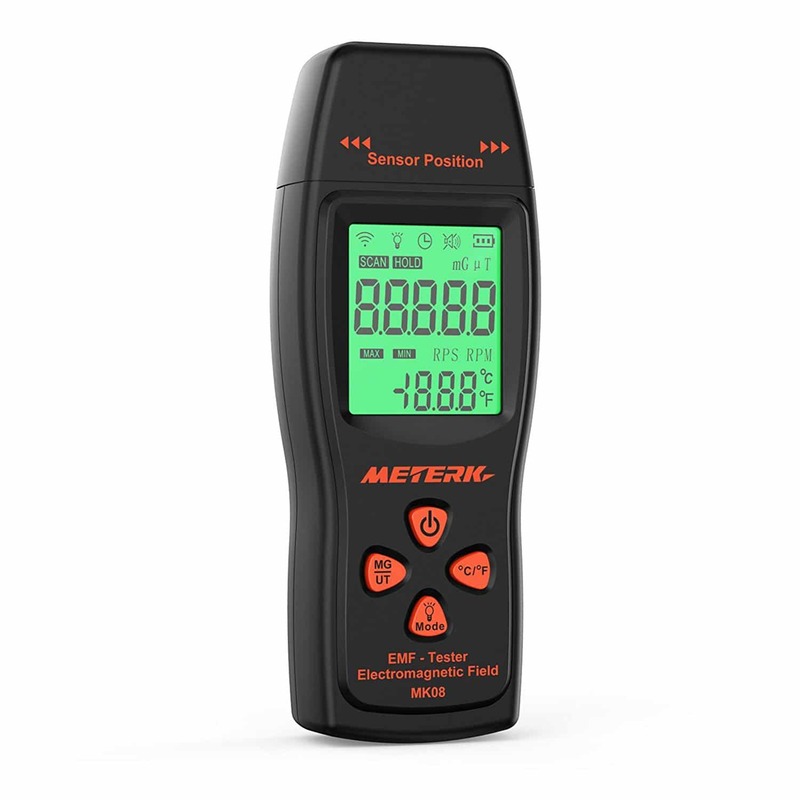 I think in the next few years, we will begin to see many more EMF friendly baby monitor options as parents become increasingly aware of the dangers. However, as of the writing of this article in mid 2019, there really aren’t all that many great options other than the one I described above, especially if you want a video baby monitor. Companies are opting for convenience and advanced technologies over the safety of the children in general. The unique thing about the NUK BabyPhone is that they built in a feature, which was originally intended to save energy, but also reduces RF radiation emissions. It has something called “Eco-Mode” which only transmits data when the baby is actually moving. They claim this will reduce emissions by as much as 90%. So, although while in “Eco-Mode” you won’t be able to view the baby anytime you want, it will automatically start transmitting when the baby is moving. I found this website that will ship this product internationally if it is something that you are interested in. If any new, quality, Low EMF baby monitor options come on the market, I’ll be sure to update this post and let you know. Now let’s talk about why you should even really care about. Baby monitors have become so much more advanced over the last 5 years or so. Whereas they used to be essentially simple two-way radios, you can now control their movement, use night vision, talk with your baby, and do so much more. Although all of this offers unparalleled amounts of convenience, it also comes at a cost. That cost, is Radio Frequency radiation emissions, a form of EMF. Most baby monitors, video or audio, use technologies like DECT and FHSS to operate on the 1.89, 2.4 GHz, or 5 Ghz frequency bands. These are the same frequency bands that your home router and cordless phones run on. So, when baby monitors send or receive data, they are doing so through packets of information sent over these frequency bands, which emits EMF radiation. When powered on, most wireless baby monitors constantly emit radiation as they are sending and receiving data. According to PowerWatch, a wireless baby monitor at less than 3 feet away was roughly equivalent to the EMF radiation emitted from a cell phone tower just 500 feet away. Check out this video featuring Building Biologist Oram Miller to get an idea of just how dangerous these baby monitors can be. I expect, and hope, to see much more main stream media exposure of these issues in the coming years. Impact on the Reproductive System. If you’ve read my post about children and EMF radiation, then you are probably much aware of the ways that children, especially babies, are significantly more susceptible to the dangers of EMF radiation as their brains and bodies are still developing. Alright, I’ll end this article here, but I really hope that you found it helpful. If you need any help with any particular aspect of this process, feel free to reach out to me and I’ll do my best to help! If you did enjoy this article, please consider sharing it! Can Bluetooth Headphones Cause Brain Cancer?